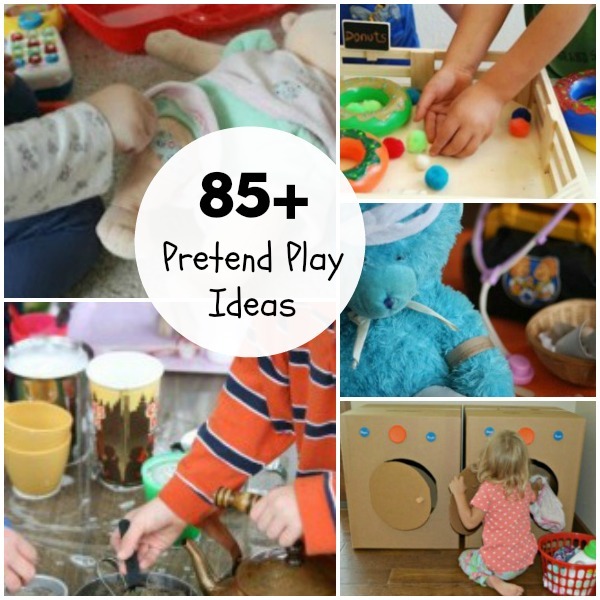 Are you tired of the same old pretend play ideas that you do with your kids? 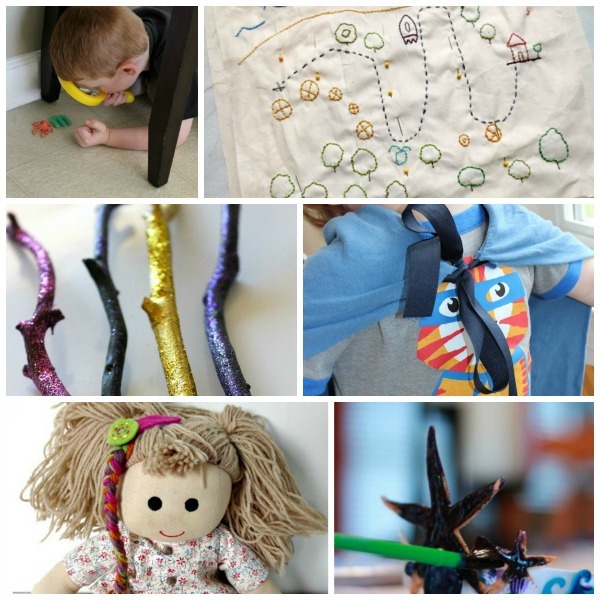 Inject some new passion into your playtime with these fresh and fun ideas for Imaginative Play. 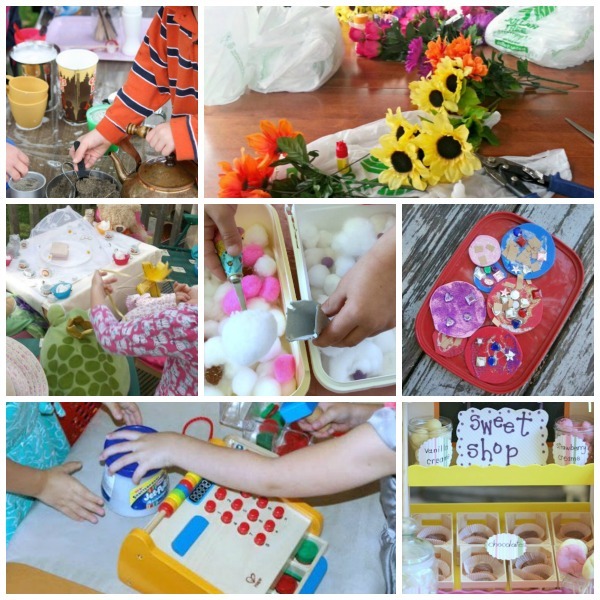 Developing Creativity – escaping into a world of make believe provides your child with the freedom to explore and develop their own creativity in a comfortable environment. This will help prepare them to think more creatively when trying to solve problems in adulthood. Growing Imaginations – popping on a costume or playing with just a few pretend play props might be all your child needs to spark their imagination. Once they start on a pretend play adventure encourage them to take the lead in a role play activity and see where they can take it or ask them questions to help them carry on with a story as they play. The more they grow their imagination now, the bigger their ideas will be when they grow up. Language Skills – Engage your child in a simple play or watch them play shops with siblings and friends and see how quickly they start to learn new words and ways of describing things. Talk to them as they play to keep the conversations flowing and to introduce new words to your children. Social Skills – Playing together with siblings, friends or caregivers is the perfect forum to improve your child’s social graces. They learn how to take turns and share responsibility as they swap roles in different role play scenarios. My own kids love to work together to put on shows for us to watch about dinner time. This could be a simple re-telling of a favourite story, a magic show or a concert of their favourite songs. Noe these shows might now win any Oscar nominations, but the team work, leadership and confidence they develop as they work together to put on these shows and the positive reaction they receive from the audience is worth so much more to them. Career Research – It’s never too early for your child think about “What they want to be when they grow up”. Setting up different dramatic play scenarios for your child to play in provides an excellent introduction into the basics of running a shop, serving in a cafe, caring for others in a hospital or looking after soft toys at the vets. Life Skills – Children learn through play so you can use play making playtime the ideal time to teach them some valuable life skills. Playing with a toy phone is an excellent time to teach your child how to make an emergency call. Setting the table is a dramatic play cafe can then be transferred to helping you set your own dinner table and then helping out with more kitchen chores as they get older. It feels like my daughter spends half of her day pretending to be an animal at the moment. She is always keen to get me involved as well. “Mummy pretend I’m a baby guinea pig and you are the mummy guinea pig.” Being a mummy animal usually involves giving her lots of cuddles and pretend treats, so it’s quite a nice way to spend a bit of time with her. Getting involved in a pretend play activity with your child is an excellent encouragement for them, especially if your child is reluctant to play or feels shy about pretending to play another role. Setting up an Animal Hospital is a great activity for a small group of friends to enjoy developing their caring side together on a play date. Pretend to be a Paleontologist in this Dinosaur Dramatic Play Centre. See how easy it is to set up your own Small World Zoo with Everyday Items. Gather up some brushes, combs and soft toys and set up your own Pet Grooming Salon. Pretend to be an Explorer and use home-made binoculars to go on an animal hunt around your home. Enjoy working together to Build your own Farm Fences from scraps of wood and then fill them up with animals and play farms. Turn TP Rolls into Farm Animals to play with on your own pretend play farm. A fun craft and pretend play activity which teaches kids about the wonder of bees. Setting up a Farm Sensory Bin for pretend play is a great way for kids to get hands on with learning about what happens on a farm. The humble cardboard box is so useful, just think how many times we use them in our daily lives. We receive parcels inside of them, use them for storage and load our groceries into them. Once you have finished with them, you could just throw them out into the recycling bin or you could hang onto them and use them in a fun pretend play activity with your kids? Had a new kitchen appliance delivered recently? Hang onto the box and turn it into a Laundry Day Pretend Play activity. A great way to teach your kids to help with the real thing. My sons are so going to want to make this Cardboard Box Hot Wheels Car Garage with Ramps. This Cardboard Gingerbread House is ideal for a spot of Christmas themed pretend play. Go for a drive in your own Cardboard Box Car. Sail away in this Cardboard Boat. How cool is this Cardboard Dinosaur dressing up costume! 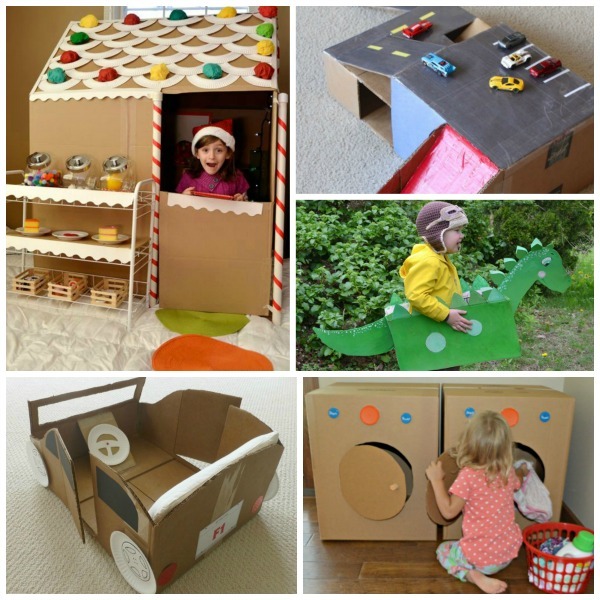 Build your own Playhouse using different bits of cardboard. Blast of into space with this Cardboard Rocket Ship. Pretend Play is great way to gently introduce new places that you may need to visit together in real life. Does your child have a upcoming doctors appointment that they are feeling nervous about or is their beloved pet having to take trip to your local vet? Acting out the role of a doctor or a vet is a good way to show and talk to your child about what is going to happen. Turn your child’s bedroom into a Pretend Play Hospital. It’s never too early to start to teach your children about first aid and pretend play is one way you can introduce it to your child. Setting up a Vet Office Pretend Play is a gentle way to show kids what happens when their pet visits the vet. You don’t have to buy an expensive doctors kit to pretend to be a doctor. Here are lots of ideas for things you will probably already have around the home to make your child their own DIY Doctors Kit. 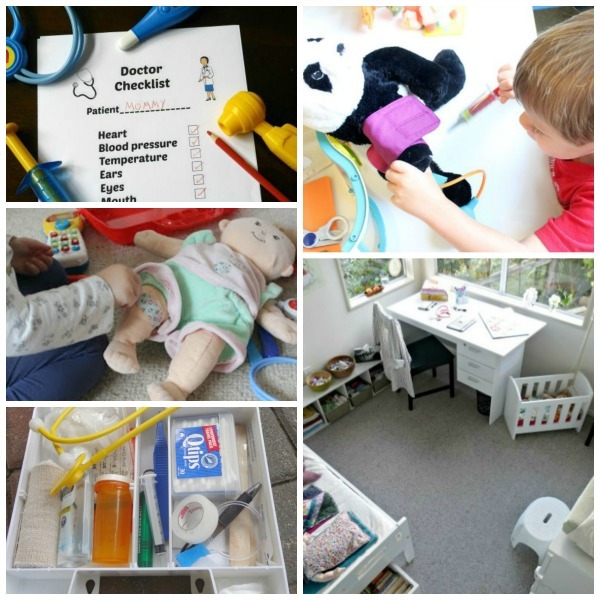 Every good doctor needs a checklist to work through and you can print one out for free over at this I’m a Doctor Pretend Play Activity. Does your child need to come along to your antenatal appointments with you? Setting up a Doctor’s Surgery Pretend Play activity before you go is a good way to explain to your child what will happen so that they won’t worry. 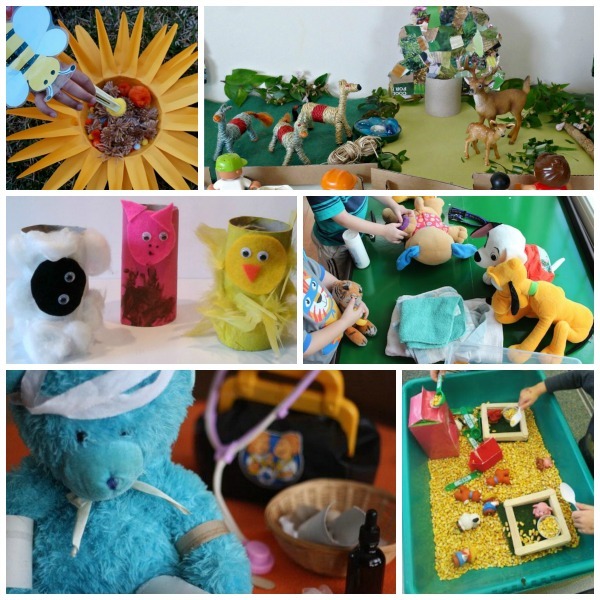 You will find lots of Vet Pretend Play Printables here to bring your own Vet Practice to life. Are you little ones fans of Doc McStuffins? Incorporating your children’s favourite TV show into a pretend play activity is a great way to engage them from the start. Growing up I spent a lot of time at my grandparents house, whilst my parents were working. One of mine and my sisters favourtie games to play there was “dressing up.” My granny had the most amazing dressing up box full of her and my Granddad’s old clothes and accessories. I remember this really big blue sunhat and my grannies scarves and shoes being personal favourites. Yes you can buy lots of different dressing up outfits now down the shops, but what could be more fun than dressing up in your parents old clothes or even up-cycling them into something much more special. Upcycle an simple headband into a DIY Mermaid Tiara and then pari it with your own Mermaid Tail. Dressing up is not just for kids, why should their dolls miss out? Make them some of these very pretty Fairy Hair Braids. Did you know that you can turn a cereal box into a Wonder Woman Tiara and Cuff set? Your very own Cardboard Sword is a must for every dressing up box. Being a Superhero is much more fun when you wear a cape. Not good at sewing? No worries here is a No-Sew Superhero Cape. Cast some magic spells with these Easy Wizard Wand’s. Pop a magnifying glass into your dressing up box and you are all ready to go on a Detective Hunt or make your own binoculars out of cardboard tubes and go exploring. Any budding pirate in the house needs a Pirate Hat and here is a very cool way to preserve your child’s Treasure Map. It is great to get kids playing outside as much as possible and there is so much potential for imaginative play outdoors. I was lucky enough to grow up on a farm and I loved to make dens around our and mud pies in our garden. If it’s too wet to play outdoors then why not bring and outdoor theme indoors. A modern twist on our childhood classic Make Mud Soup. If you are not fan of the real thing set up an Indoor Bug Hunt. One for the summer. Gather daisies from your garden and mix up some Daisy Soup to serve for “tea”. Who else enjoyed making Fairy Gardens when they were a kid? I loved making these Miniature Gardens with my own kids. Here’s a good idea for a DIY Playhouse in your garden. Makeover your Shed. This Garden Birds Small World is an ideal way to play and learn about the birds that you see out in your garden. There are so many materials that you can gather outside to play with. 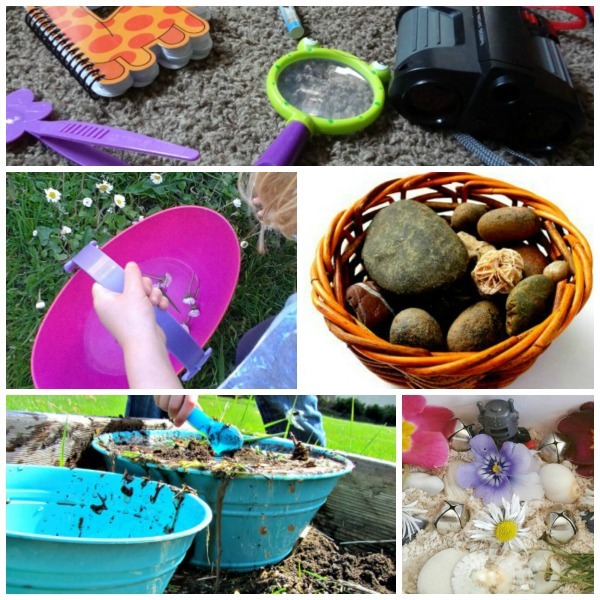 Check out these ideas for Natural Materials for Pretend Play. If it’s too wet to go camping out in the garden, come indoors and set up a Pretend Camp Site. This Paper Bag Vest and DIY Binoculars set are perfect to add extra fun to your “Camping Trip. Try our recipe for Magical Mud Pies. My kids love cars and can spend many a wet afternoon zooming them around the house pretending to be racing car drivers or cops and robbers. Our playroom currently had a masking tape road map over half of it as well which they use for one of their many car related play times. 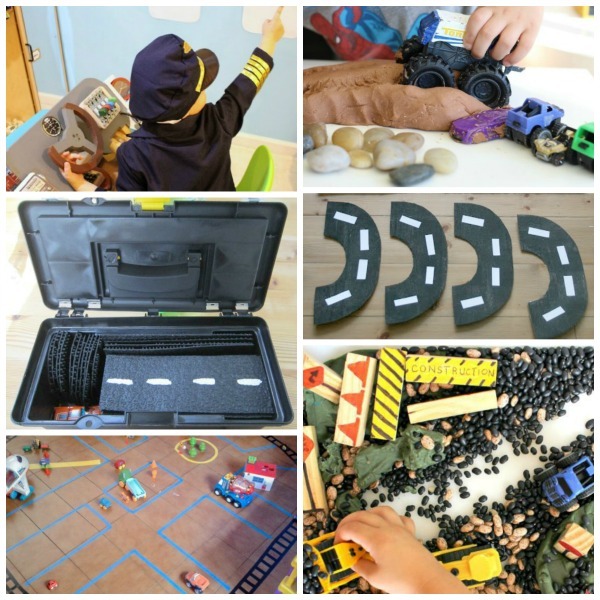 Get your child’s imagination moving with these ideas for pretend play activities using cars, trucks and diggers. This Car Track Busy Bag made from a rubber car mat is just genius. Did you know that Jenga pieces make great road signs for some some Construction Zone Pretend Play? Do you have some Big trucks in your toy box? Then make some play dough mud for them in this Monster Truck Pretend Play Activity. Simply sticking down tape on your floor can transform your room into a Pretend City for your vehicles to drive around. Turn your lounge into a landfill and enjoy some Garbage Man Pretend Play. Fly away with this Airport Dramatic Play Centre. I have lost count the number of pretend ice-creams I have “consumed” and how may orders I have placed in my kids all time favourite dramatic play setting – “Their Cafe” but it is a game I will never tire off (even though it does make me really hungry”) as I know how much good it is doing them as they play. My middle some even has aspirations of becoming a chef now which I am sure is partly down to the number of hours he has spent cooking for me in his pretend kitchen. Play food can be imaginary, made from recycled packaging, you could even sew your own or buy a cheap set online. I had aspirations of sewing a set of felt food for my kids, but after spending an hour sewing a fried egg I gave in and bought a cheap set (the fried egg has made a great pin cushion for me so it wasn’t an hour totally wasted!). It has had so much use though, so it turned out to be a great investment. A Donut Shop is so much more fun with some cute DIY Donuts. These Simple Felt Chocolates would look great in a pretend sweet shop. Re-use your old Pizza Boxes and make your own Cardboard Pizzas for your very own Pizzeria. So many cool ideas here for DIY Felt Food for some shop or restaurant pretend play fun. Bake your own Salt Dough Bread to go in your Pretend Bakery. Have fun setting up your own Pretend Lemonade Stand. Did you know that Play dough works great as Pretend Ice Cream? Who doesn’t remember playing shop when they were a kid? A childhood institution and one of the simplest imaginative play scenarios to set up. You can easily set up your own shop at home filled with empty packaging from your recycle bin and a toy till. Encourage your kids to take turns being customer and shop keeper as they play together. Playing shops is also a great way to introduce the concept of money and to practice using it before your kids are let loose in a shop alone once they are old enough. Have fun serving ice cream in your own Ice Cream Parlour or learn about money whilst playing cafes. 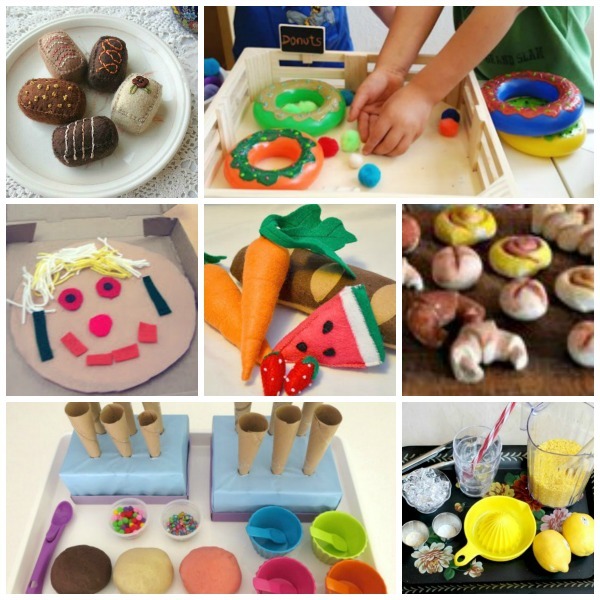 Set up a Play Dough Sweet Shop or Dramatic Play Kitchen area. This Coffee Shop is stocked with sand, soap and water for some outdoor backyard fun. Make a Magazine Collage Shop and play with real money. Open your own Italian Restaurant for lots of Pizza and Pasta isnpired fun. Host a Tea Party which is fit for a Queen. Every child needs to play Grocery Store at home. Make Apple Pie the speical of the day in your cafe. Bake some cardbaord cookies in your own Bakery. You’ll always have flowers to admire if you have your own Flower Shop at home. Making your ow puppets putting on a puppet show is a great rainy day activity. Give your child as much freedom as possible to design and make their puppets and write and perform their own show. They might just surprise you with their creativity and imagination. Disposable gloves transformed into Finger Puppets with the little help of a few Sharpies. Wooden Spoons are perfect to turn into puppets as well. Get started with these Goldilocks and the 3 Bears Puppets. A Cereal Box is great to use as a base for a DIY Puppet Theatre. Do you remember making Sock Puppets at school? Save up some paper bags and turn them into Paper Bag Monster Puppets. 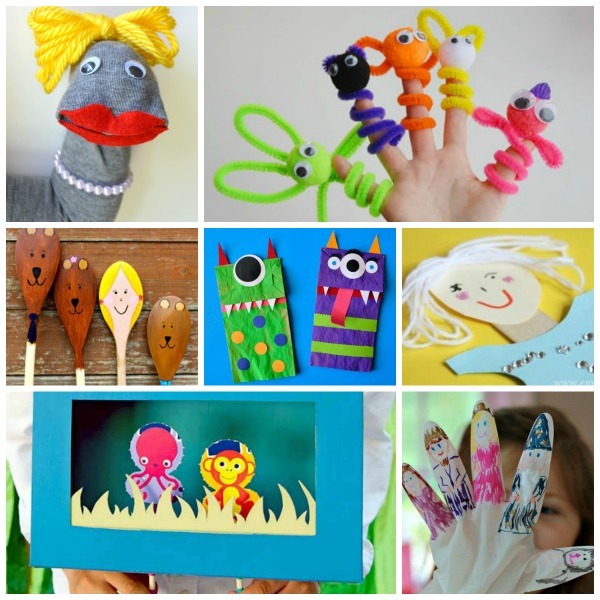 Another cool way to make Finger Puppets this time using Pipe Cleaners. Make some Popsicle Stick Princess Puppets. My middle son comes up with the best stories. I wish I had just half of his imagination. He can sit down and write a tale or just tell a story with ease to his siblings as they play together. Encourage your children to tell stories with a small world play or make some Story Stones. Make your own Small World We’re Going on a Bear Hunt to play with after reading the classic book. Re-create the story of the Three Little Pigs with this pretend play activity. These 10 Apples on Top inspired Apple Trees would work great on a small world farm activity. Setting up a Story Basket is a great way to expand on a story after you have read the book. Here is a lovely one inspired by Goodnight Gorilla. Re-tell the Fairy Tale of Rapunzel and her long flowing hair with this Small World Invitation. Or why not have a go at writing your own Spooky Sticker Story.